Hello friends! We are all love the BOYS! Well what are little boys made of snips and snails and puppy dogs tails. if you’ve been reading jennyandteddy for a while, you know we are waiting for our little boy to arrive! So there will be all things boyish pattern coming. 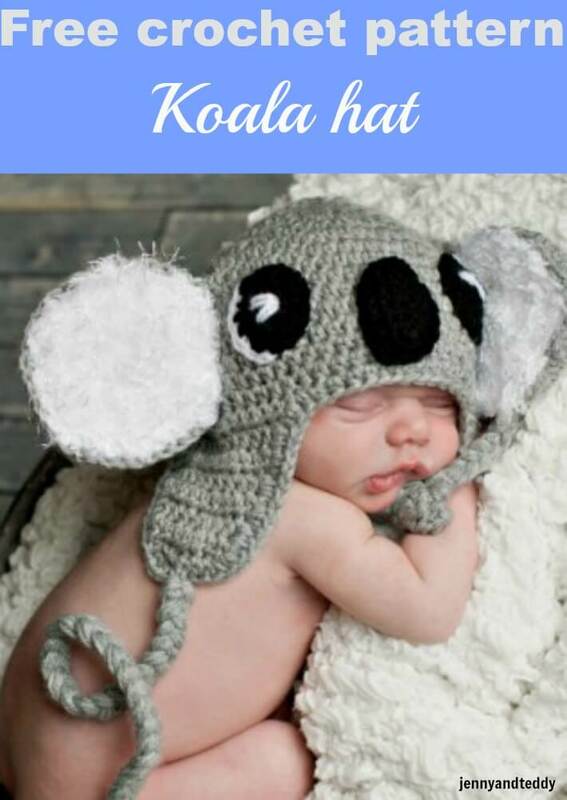 Today we are going to make a Koala bear hat! This pattern is so simple to make you can easily whip them up in an hour. 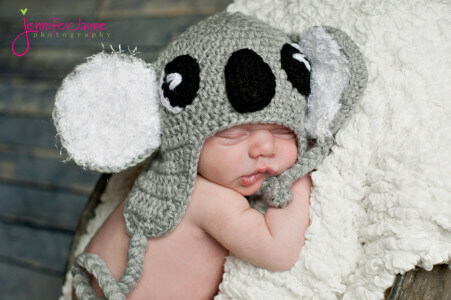 Special thanks to Jennifer Jayne photography for super cute photo. MC: weight of yarn to be use 100 grams/231 meters. Sample using Marvel Brand Moda Vera 100% acrylic). You can substitute any yarn that gives you gauge. In this pattern, you will work in the round continuously. You may use a removable stitch marker or a short piece of yarn of contrasting colour to mark the beginning of each round. At the end of each round, you will not join, but begin the next round in the next stitch. The stitch counts at the end of each round are given. Rounds 8 – 16. hdc in each st around (49 sts). Finish off. Round9-20. hdc in each st around (56 sts). Finish off. Round11-24. hdc in each st around (70 sts). Finish off. 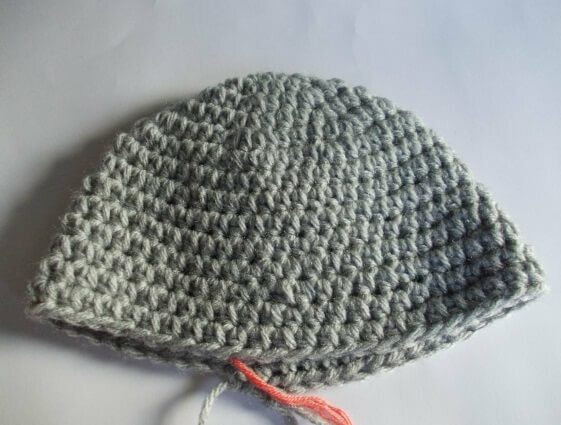 Use two stitch markers to mark the stitch in the middle of each side of the hat. Join MC at the first marker with sl st.
Row8. hdc in next 8 sts, (9 sts) and fasten off. Join MC at second marker with sl st and repeat as above for second earflap. Join MC at any st along the edging with sl st and work hdc around the edge, including the earflaps. Fasten off. With Main Colour, loop yarn into approximately 18-20 inch long loops as shown in the picture. Note. Please use these pictures only as a guide. Using a crochet hook, pull the folded side of the yarn through the centre stitch at the bottom of the earflap, making a loop. Pull the free ends of the yarn through this loop and pull tight. Divide yarn in to three parts, plaint or braid to the end, and tie a knot to finish up. One tie is made. Repeat on the other earflap to make second tie. 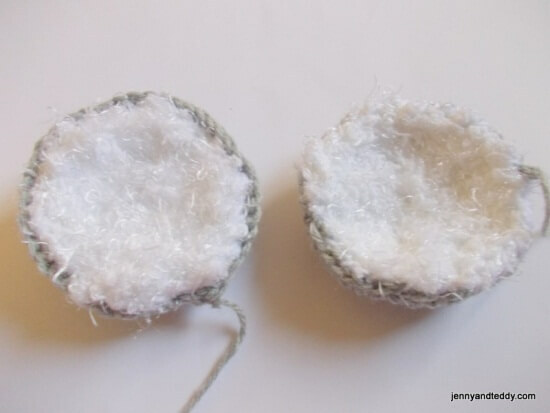 See photo tutorial of how to adding braids or ties to the earflap. Round1. sc in next st from hook and around (12sts). Round7-8. sc in next st around. (42 sts). Then finish off and leave long tail for sewing. 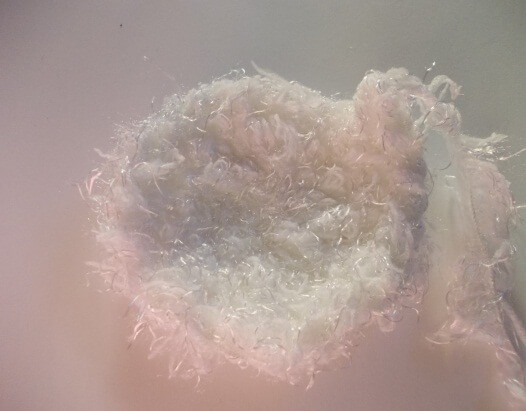 Inner ear(all size): CC: fancy yarn. Round5. *sc in next 3 st, 2sc in next st*, repeat from * around (35 sts). Then finish off. 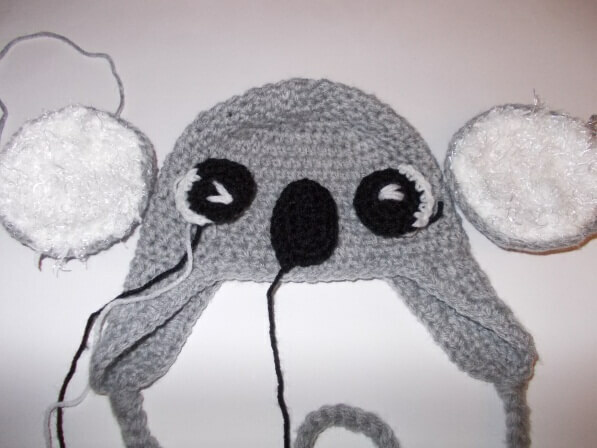 Put white (inner ear) and grey (outer ear) parts together, work with grey colour Hdc around the entire ear. Round4. sc in next 12st and pick up white colour sc in the last 6 st. (18 sts). 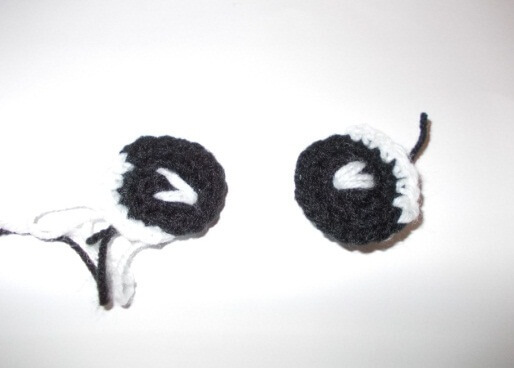 Attach eyes follow by nose and ears by sewing use yarn needle. If you are not already a Craftsy member, then sign up for free first then you can download from my Craftsy page. After login simply add the pattern to your card and then checkout. 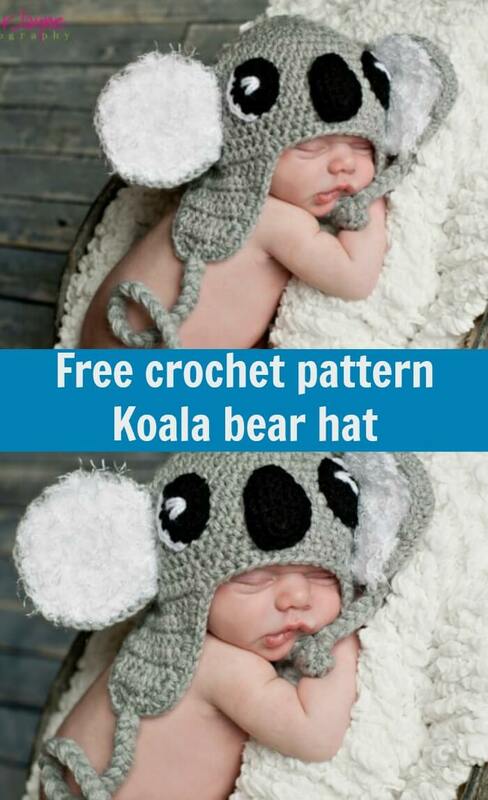 What an adorable koala hat! Such cuteness! Thanks so much for sharing, I truly love it! Thank you Lily, I like your crochet fish candy. OMG! 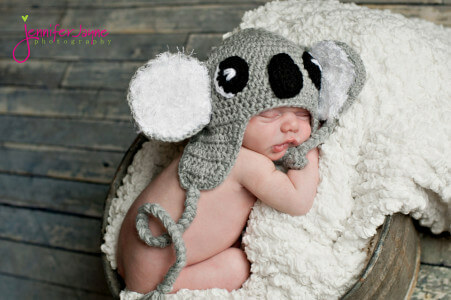 That hat is trip over myself adorable. I haven’t made a crochet item before, but maybe one day I can get inspired to. HI Rachel, thanks you so much for lovely comment. I love these little hats!! And really want for my grandchild that we are expecting in Sept!! 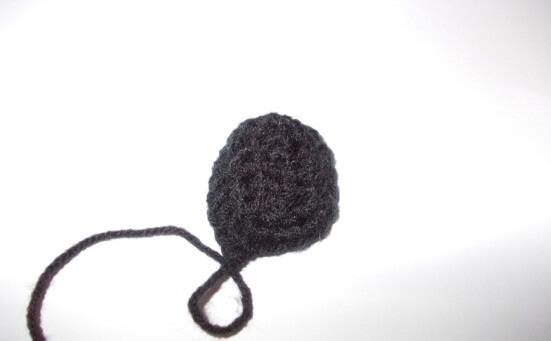 I only know the basic with crocheting…do you think I can do it?? Thanks for sharing! [email protected] would like you to read..Stained Glass Projects!! 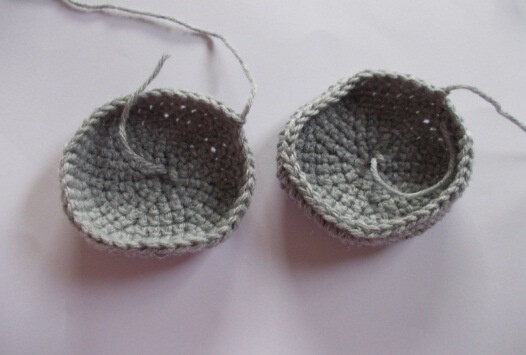 HI Elaine, yeah you can do it coz it very easy use only baby crochet like single crochet or halfdouble. Your hats are simply adorable! It makes me want to get out my crochet hooks! Thank you for sharing at The Creative Exchange! Oh Thanks so much for stopping by Amy. So cute. Great pattern. I’m pinning. Thanks so much for sharing with Wednesday’s Adorned From Above Link Party. Good morning, Jane! This is super duper cute! I’m also impressed with the photo itself. Looks like a calendar picture! 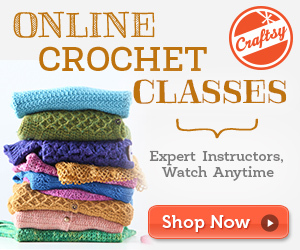 I cannot crochet, but this makes me want to learn how. 🙂 I’m featuring you today at “Our Favorite Things Pinterest Party” today. I hope you will come back by and link up again this month. (FYI…Please remember to link to your pinterest PIN of the post, however, or this time it will have to be deleted.) Have a great weekend!! Oh my, baby and hat are both precious!! Thanks for sharing with SYC. Jane, greetings! Found this on the Garden Tuesday party. It caught my attention right away because it didn’t have a garden theme & confused me. I’m so glad I checked it out though. You are so talented! It and the baby are adorable. Am pinning this for the next baby that comes along. Adorable! Thanks for sharing this cute project at The Pin Junkie. It was featured at this week’s party! For the crochet hook , you used a size d? 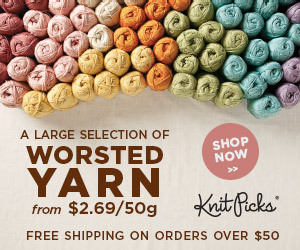 What is the weight of the yarn? I use crochet hook size E =3.5mm for yarn is worsted weight yarn. What did you do for the ties on the flaps? 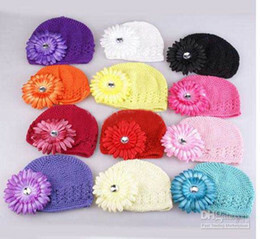 Hi Jenet, Thank you for spot on , I just add the writing of how to add ties to earflap in the post please check it out. Hey I made this hat for my little guy and loved it!! Do you have a pattern for it that’s bigger? Like preschooler? 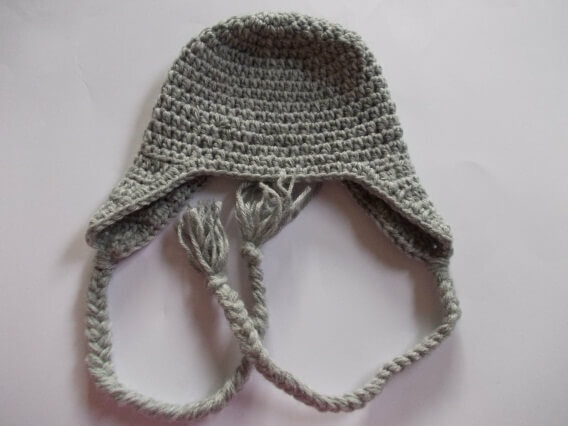 Hi Ashley , Sorry I donot have the pattern for bigger size but could make the crochet increase to make the hat bigger.